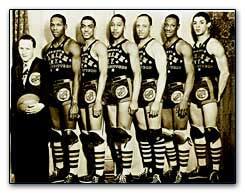 What is the equivalent of the Harlem Globetrotters in other fields or endeavors? Did the folks at Anderson Accounting have the all stars of the accounting world? Doesn’t Goldman-Sachs have the financial geniuses of the investment world? Didn’t the Chicago Bulls have the best basketball players during the 1990’s and the New York Yankees have the best ball players in the past century? But the Globetrotters are not usually the all-star players. They are good at what they do. But what they do is not play basketball to win. What they do is play to play. They work hard at their play, but they play. I know they could be beaten by a number of college and professional teams. But their point is not to win, but to stretch. Not only to entertain but to help us imagine other possibilities. The Globetrotters have always been able to try out new things without the burden of pulling off a winning season. They are able to suspend the competitive expectations of athletics in order to create space for experimenting. In the evolution from trick shots to alli-oops, in adaptation from flashy ball handling to driving down the lane, I suppose the capacity to dream of new skills has been egged on by the Globetrotters. What would it look like if we tried the same experiments in other fields? Non-competitive, low-stakes landscaping? How about developing similarly choreographed ways of cleaning dishes after meals? Or shopping? Or preaching? Or whatever we do? What ever happened to playing? What happened to our ability to create playful episodes in our routines? The other night with my son Nathan (the animal lover) we watched a PBS show on young animals. A couple of lion cubs were wrestling each other. As they played, one of the moms of the pride noticed the cubs needed a lesson. Mom and one of her co-moms started to play. They demonstrated the move that knocked the hind feet out from under their prey. Then, just in case the kids didn’t catch on, Mom went and demonstrated on them. Soon the lion cubs were knocking each others’ leg out from beneath them. Why do we stop playing? In the pressured moments we expect so much from each other. We need to win. We have come to expect ourselves to be winners. Frequently we find ourselves, those we love and the groups of people that mean so much to us in a state of desperation. In my town, the onslaught of meth is a high stakes competition of the lives of our neighbors. In my church, we find at stake traditions of justice, community and peace that are waning as our impact on our community dwindles along with our membership. In the boom and bust cycles of business, we feel the threat of layoffs and suspended wage increases. The list can keep growing until I have us all depressed. But the point is we all have so much at stake. We are frustrated. In the dialogue of Tom Stoppard’s play, Rosencrantz and Guildenstern are Dead, “somewhere, there was a place, we could have said ‘no’.” But now we live in the pressured and burdened time of high stakes consequences. We loose stress-out, we self-medicate the pain with habits and chemicals and sleep. And it is this very feeling of anxiety that makes it all the more difficult to play. The lions know in their animal way of knowing, that play is not about fun first and foremost, but about survival. In the different roles and parts we play in families, churches, businesses, and community, we need to play. In modern parlance, it doesn’t get us too far in the right direction to be known as “players.” But playfulness may be the key to our survival. Perhaps the Harlem Globetrotters exist to save the world.